A recent headline — Parents angry after finding children’s names on police ‘gang lists’ contains the epitome of parental denial of a problem. Are there really parents in today’s world who believe their kids are innocent just because the kid says they are? Apparently Mom and Dad school have lower attendance numbers or, maybe, this isn’t taught any more. Nonetheless, it’s a timeless principle — except when you fail to accept responsibility for the children you bring into this world. Here’s a few clips from the story, in an attempt to put (what I see as) the reality into perspective . . . Neither boy had ever been arrested and, (the mother) said, (and) neither was involved with gangs. Well, the mother may be an authority on whether her son had ever been arrested, though the police would know better. She is not an authority on whether her son is in a gang, unless, of course, she is with him around the clock. What this response means is either 1) my son told me he is not in a gang and those drawings on his school papers and suspicious friends he hangs with don’t convince me otherwise, or 2) I have more important things to do than keep track of my son’s whereabouts and have taught him that denying reality makes it go away.
. . . more than 50 people, all but a few of them black, showed up . . . heard eight representatives of law enforcement agencies, all but two of them white, tell them why they keep these lists and how they use them. Anytime the media, or observers for that matter, make a point to note the races of those involved without also showing why that was important, it’s not. More police officers are white and more street gang members are black. That’s not something that affects the facts of the case. I am pretty sure it doesn’t change readership. JR got on the list, according to Largo police records, because police found 11 pictures of him online displaying 119 Boys hand signals, and because a police officer saw him once with other gang associates, and because he once ran away from a sheriff’s deputy while accompanied by another gang member. “It’s hurtful,” said JRs mother, about her son’s inclusion. Those facts, for people who are not the boy’s parents, serve as a clear indication that he at a minimum has an interest in local gags and more likely is an associate or member. These are also an indication that the boy’s parents haven’t seen the indicators or have ignored them and denied they are indicators. They are not an indication that the police intended anything to be “hurtful” as that’s not in their job description. No, Mr. Dillinger, you actually have a way to know whether the list is accurate — beyond the police simply “saying it” — it’s the part above where it says “Prosecutors need to prove gang membership to a judge.” That’s how (and why) our justice system works. If you saw this as a rant, then it’s over. Something had to be said. If you are a parent and want to know what indicators to look for — check out the warning signs. Laws against gang recruiting: Worth the time and effort? The FBI’s National Gang Intelligence Center (NGIC) keeps us updated on their “conservative” estimate of the number of gang members in the United States. At last count there were 1.4 million. That figure represented an increase of 400,000 over the conservatively estimated 1,000,000 as of September 2008. 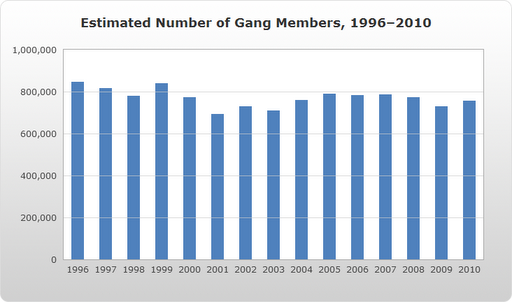 The 2009 NGIC estimate represented 212,000 more gang members (26% higher) than the 2007 report. The estimate was 215,000 (28%) higher than the number of gang members reported by the National Youth Gang Center in 2006 (NYGC). The estimate was also 200,000 (25%) higher than the 800,000 gang members reported by the Federal Bureau of Investigation’s Deputy Director Pistole (2008) in March of 2008. Meanwhile, the National Youth Gang Center reports gang membership is now pretty close to where it was 15 or so years ago (1996-2010). Following a yearly (limited) decline from 1996 to a low in 2003, annual estimates steadily increased through 2010 (NYGC). And how are those increases in membership numbers achieved? Many local jurisdictions have started targeting recruiting for gangs — making it a violation of the law. And some states have shown an interest in doing the same (specifically AL, AK, AZ, AR, CA, CO, DE, DC, FL, GA, ID, IL, IN, IA, KS, KY, LA, MD, MA, MI, MT, NE, NV, NH, NJ, NC, ND, OK, SC, TX, UT, VA, WA, WI, WY) (that was 34 states plus the District of Columbia). Some states, for example Pennsylvania, Florida and Georgia, have gone beyond that and said gang recruiters can’t require a prospect to commit a crime. MN has laws that don’t appear to prohibit recruiting (prohibiting simply one who solicits or conspires with a minor to commit a crime or delinquent act) , but do address other forms of threat and intimidation. Is this a strategy based on reality? Do we really think that by telling leaders of criminal groups that recruiting new members is wrong they will stop doing so? Perhaps we should also tell them that about threatening or knowingly causing injury or death; receiving money or anything of value from the commission of an aggravated burglary; or from the illegal sale, delivery or manufacture of a controlled substance or firearm, or any of the racketeering offenses we examined in Gang Laws and their inability to be useful against real criminals! Ultimately, I don’t think prohibiting recruiting will work, as intended, if the intent was to get the gang members to swear off recruiting. 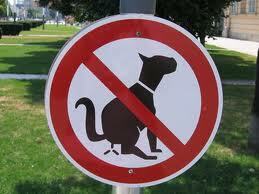 In fact, it reminds me of the signs my dog is inclined to ignore on our walks (until she experiences human intervention). But it might give the kids they recruit something to think about and may give the police another strategy for stopping the gang activity that plagues our nation. Public disclaimer: I am a founding board member of the Tennessee Gang Investigator’s Association, headquartered in Hixson, so I might have a propensity to think gang cops don’t get enough support. A Duck is a duck is a duck: Can another person identify a gang member? Many gang investigators have said they use the “Riley Method” to identify gang members. Most haven’t actually called it that, but it’s true, nonetheless. A problem for Florida, Tennessee, Kansas, New Hampshire, South Dakota, and maybe Idaho (which appears vague on who does the identification required), that is. P59: Testimonial statements of witnesses absent from trial have been admitted only where the declarant is unavailable, and only where the defendant has had a prior opportunity to cross-examine. P68: Where nontestimonial hearsay is at issue, it is wholly consistent with the Framers’ design to afford the States flexibility in their development of hearsay law — as does Roberts, and as would an approach that exempted such statements from Confrontation Clause scrutiny altogether. Where testimonial evidence is at issue, however, the Sixth Amendment demands what the common law required: unavailability and a prior opportunity for cross-examination. P69: Where testimonial statements are at issue, the only indicium of reliability sufficient to satisfy constitutional demands is the one the Constitution actually prescribes: confrontation. So the application appears to be where one person is (or will be, or could be required to, or might as well be) testifying against another. It appears those testimonies are only usable when the person who would testify is . . . dead. Otherwise, the witness must be available for prosecution. I suspect that due process should be a consideration when classifying a gang member either on the streets or in jail/prison, so a hearing would be the logical followup to such classification if it were to be challenged. It’s not a huge reach to suggest that the statement/testimony of another (non police) person should be subject to challenging by the accused gang member. 4. Wearing of Gang/STG colors, gang clothing, gang paraphernalia. 6. Possession of commercial Gang/STG publications. 7. Participation in commercial Gang/STG publications. 9. Contact with Gang/STG members. 10. Participating in a photo with Gang/STG members. 12. Correspondence with Gang/STG members. 13. Named a Gang/STG member in correspondence. 14. Confirmation through outside agency gang unit or database. 15. Engaged in Gang/STG Crime or activity. 16. Identified as gang member by another gang member. 17. Subject identified as gang member by reliable informant. Numbers 13, 15, and 16 require the statement of another, non-law enforcement/corrections person to be used against the gang member in order to confirm them. That’s similar to hearsay, which is allowed only in a select few, specific circumstances. Specifically, in Crawford v. Washington, 541 U.S. 36 (2004). I suspect that 17 would be fine, as the credibility of informants is measured based on a track record so they would likely be closer to police than an everyday citizen. It may not be a problem for those using civil law to counter the gang problem . . .
Change 1, February 22, 2012 to DoD Instruction (DoDI) 1325.6.
a. Commanders should remain alert for signs of future prohibited activities. They should intervene early, primarily through counseling, when observing such signs even though the signs may not rise to active advocacy or active participation or may not threaten good order and discipline, but only suggest such potential. The goal of early intervention is to minimize the risk of future prohibited activities. – these are all feel good guidelines. The reality is that Commanders (and other unit leaders) remain alert for signs of bad morale and things that affect the mission. They usually don’t see “what someone does off duty” as something that falls into those categories. What they don’t get is that these gang members are 1) smart enough to conceal their affiliation, 2) learning trades they can use to help the gang, and 3) using their military experience and exposure to access the logistics pipeline to help drug and weapons trafficking endeavors, etc. – The military is not and is not designed to be engaged in anything resembling early intervention or minimizing the risk of future prohibited activities. Those are activities for communities where there are youth gangs who can be deterred from crime. All military members are adults, and those who are gang members and military service members are far from intervention time. b. Examples of such signs, which, in the absence of the active advocacy or active participation addressed in paragraphs 8.a and 8.b are not prohibited, could include mere membership in criminal gangs and other organizations covered under paragraph 8.b. At the time the directive was initially published in 1969, the DoD was concerned with the infiltration of anti-war and anti-military organizations. The directive focused on dissident and protest activities within the military, and especially on activities such as underground newspapers, on-post demonstrations, and serviceman organizations. In 1986, the Secretary of Defense updated the directive. The directive’s language prohibited “active” participation in “extremist organizations.” This comes from language in Executive Order (EO) 11,785 issued in 1953, during the height of the Cold War, when the government feared Communist infiltration. It was later changed to forbid designating any groups as “totalitarian, fascist, Communist, or subversive” and forbade any circulation or publication of a list of such groups. We had problems linking the directive to gangs because of it’s history (originally launched from an Executive Order (EO 10,450: http://www.archives.gov/federal-register/codification/executive-order/10450.html) prohibiting communist groups from infiltrating, then war protesters, now extremists. Signs could also include possession of literature associated with such gangs or organizations, or with related ideology, doctrine, or causes. While mere membership or possession of literature normally is not prohibited, it may merit further investigation and possibly counseling to emphasize the importance of adherence to the Department’s values and to ensure that the Service member understands what activities are prohibited. I am tempted to ask what they are talking about when it comes to literature. Are they talking about Gang/STG documents: rosters, procedures, bylaws, codes, etc.? What about Gang/STG commercial publications? What about illustrations or artwork? Unfortunately, these are the same questions that would allow a defense attorney to claim the instruction is vague and over-broad, and that’s an indication that more thought should be invested in it in the first place. Florida gang law prohibiting requiring recruiting prospects to commit crime OK! According to Associated Press (AP) coverage of the appellate court in the 1st District, the Florida Law prohibiting gang leaders to require new members to commit a crime to join the gang is fine, just fine. The court did not like the prohibition against using technology to communicate, however. Apparently the law would have made it unlawful not just to discuss gang business but other things, as well. The recruitment law passed constitutional muster because it applies only if criminal activity is a condition of membership. It’s been my experience that gangs and crime go hand-in-hand, and most who join gangs commit a crime to do so. District Judge Stephanie Ray wrote that in the recruitment law, the Legislature “attempted to strike a proper balance between protecting fundamental rights and using legitimate government police powers to fight the scourge of gang-related criminal activity.” She noted several other states, including California, Texas, Indiana and Idaho, have passed similar laws, some of which also have been upheld by the courts. Section 874.05(1), the “gang recruitment” provision, was enacted to protect the public from speech and conduct used to encourage gang membership, where a condition of membership or continued membership is the commission of any crime. 874.05 Causing, encouraging, soliciting, or recruiting criminal gang membership.— (1) Except as provided in subsection (2) [which deals with a second or subsequent violation], a person who intentionally causes, encourages, solicits, or recruits another person to become a criminal gang member where a condition of membership or continued membership is the commission of any crime commits a felony of the third degree, punishable as provided in [various statutes]. § 874.05(1), Fla. Stat. (2009). compelling interest in protecting the right of each of its citizens to live at peace in the sanctity of his or her home, free from violence and the threat of violence.”). Under the second prong of strict scrutiny, we review section 874.05(1) to ascertain whether it is narrowly tailored to promote the compelling governmental interest . . . under Florida’s broad statutory definitions of “criminal gang” and “criminal gang member,” a person can join or associate with such a group without any actual intent to commit a crime. § 874.03(1), (3). This statute criminalizes the speech and conduct of the solicitor/recruiter, rather than the person solicited or recruited. Although the language of section 874.05(1) is silent regarding whether the solicitor/recruiter must know of the crime-related condition of gang membership, silence alone does not necessarily suggest the legislative body “intended to dispense with a conventional mens rea element, which would require that the defendant know the facts that make his conduct illegal.” Staples v. United States, 511 U.S. 600, 605 (1994) (holding that in order to convict a defendant of illegal possession of an automatic weapon the government had to prove the defendant knew of the automatic character of the weapon); see Morissette v. United States, 342 U.S. 246, 263 (1952); State v. Giorgetti, 868 So. 2d 512, 515 (Fla. 2004). The Legislature has narrowly tailored this law to effect its intended purpose to promote public safety and prevent crime without impermissibly intruding upon the rights of law-abiding persons or, for that matter, the discrete lawful activities of gang members. The case is Naymontie Nashare Enoch v. State of Florida, 1D10-3443. The odds of finding a "pattern of criminal gang activity"
The criminal gang offenses are committed within a five-year period. Put another way, it means the (presumably street-wise) gang member has to avoid conviction of all but two times he commits a felony in five years to keep from having this enhancement apply to his actions. To understand how easy this is, consider the arrest rate of people, generally, for all crimes, bearing in mind that gang members have a built-in mentoring and arrest avoidance program. The FBI reports an arrest rate based on the population. They reported in 2009 that the arrest rate was 4,478.0 arrests per 100,000 inhabitants of the total estimated United States population (violent crime was 191.2 per 100,000 and property crime was 571.1 per 100,000). That means that an estimated 4500 arrests were made for every 100,000 people, or 4 1/2 per 100 (4.5%). This method of calculation shows arrest rates but what about the arrest percentage, or: How likely is a perpetrator to get arrested for committing a crime? This is often represented by a crime funnel. 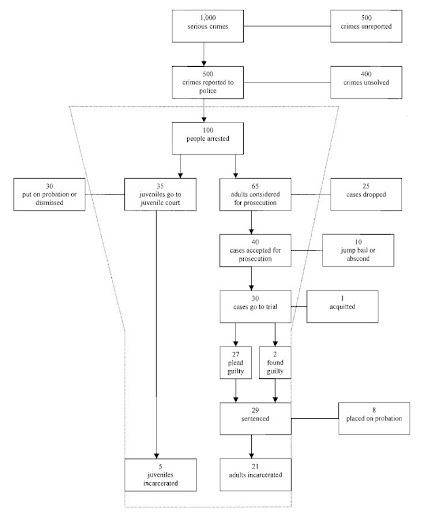 The funnel represents the much lower number of crimes detected and punished by the criminal justice system than the number actually committed. Early in the criminal justice system (where the police are), many arrests are made, but the number to be prosecuted shrinks as they are removed from the process. Some are dismissed, while others get referred for treatment or counseling. Note that the basic numbers go like this. For every 1,000 crimes committed, 500 of them (that’s half) are reported to the police. Of the 500 reported to the police, 100 arrests (that’s 20% of the crimes reported and 10% of the crimes committed) are made. And now that the police have done the hard work, the folks in the rest of the “system” take over. Of the 100 arrests, about one-third (35%) are juveniles, and 30 of them are put on probation or have their cases dismissed. Though many gang members are juveniles, you can imagine how that wraps up — stick with me for the adult analysis. Of the 100 arrests, about two-thirds (65%) are adults, and 25 of those cases are dropped. Of the 40 people remaining, prepared for court (a function of the Courts part of the Criminal Justice System), 10 jump bail, abscond, or otherwise take affirmative action to avoid further prosecution. From the remaining 30, 27 plead guilty in court, 2 who didn’t are found guilty, and 1 (of 30 who remain of the 100 arrested for the 1000 crimes) is acquitted. Note, if you will, that acquitted is not the same as innocence — it’s the same as there wasn’t enough evidence to support the charges. Note, also, that the court system is where multiple incidents can be combined into one and felonies can turn into misdemeanors. Of the 29 people sentenced, 8 of them (about 27%) are placed on probation and 21 of them are incarcerated (both are functions of the Corrections part of the Criminal Justice System). To make sure we have that locked in and comprehended — for every 1000 crimes committed, 500 (half) get reported. Of the reported crimes, 100 arrests (one-fifth) are made. Of the people arrested, about 29 people (less than 30% of those arrested) are convicted, and 20 (one-fifth) are incarcerated. That’s a little different than the FBI numbers, don’t you think? So, assuming a gang member doesn’t get locked up for five years, they have to fight the odds of getting convicted of two separate felonies or three separate misdemeanors during that time OR they can be identified as being involved in a pattern of criminal gang activity. A great civil law tool — injunctions and related actions against gangs — but what about civic involvement — Southern Style! It’s not been covered too much in the news, but check out Metro Files Lawsuit Against Accused Gang Members: Metro’s legal department has filed a lawsuit against the Kurdish Pride Gang (KPG) and several of their alleged members, asking that they be declared a public nuisance. Wouldn’t it be nice if all the gangs and other organized crime groups — heck, even regular everyday criminals — could be declared a nuisance? Unfortunately, there don’t seem to be enough citizens who are 1) annoyed and 2) able to stand up for themselves. I completely support the MNPD‘s actions, but why is it they seem to be the only ones acting like gangs in our communities are a bad thing? These groups have been treated as if they are living the American Dream — and unfortunately in many cases, they are. Typical responses to gang behavior include public (community or neighborhood based) official (using the criminal justice system) and legislative (local, state, and federal legislative bodies) action. Local anti-gang legislation like civil abatement laws, injunctions, and restrictive ordinances rarely make an impact on gangs, though they often force a move out of “our neighborhood”. With these injunctions, gang-free zones are sought (like public parks or neighborhoods). In this country, it′s not against the law to be a member of a gang. The First Amendment gives us the right to join any group or club, assuming we meet their requirements. Implicit within this right is the right to associate with members of the group. That seems to indicate the right includes membership and affiliation with gangs and gang members. What is prohibited is the committing of crimes and other actions that gang members often do. In a nutshell, then, it’s legal to be a member of a gang, but not to be an active member, as active gang members commit crimes (or their group would not “qualify” as a gang). The constitutional right to assemble allows us to gather (only) for lawful purposes. Thankfully, the courts have held that the government may prohibit people from associating in groups that engage in and promote illegal activities. With injunctions and related actions, the gang is sued as a public nuisance with evidence provided by the police and sometimes members of the community. Injunctions have been seen to reduce gang member visibility, gang intimidation, and fear of crime by residents. That works for the community, at least for a time, but we can do better. The better strategies incorporate the community-based policing efforts that include mobilizing and interacting with community members in a coordinated effort. When there is an established community policing effort (not unlike what it took to implement bike patrols, drug market interventions, and the use of Data-Driven Approaches to Crime and Traffic Safety — DDACTS), prosecutors and police can include input from police, prosecutors, merchants, property owners, and other community members when devising strategies like obtaining injunctions, so there’s more of a chance the affected parties are included in the decisions. Additional work to improve neighborhood cohesion and informal control is needed, but let’s not depend entirely on the police to do it. Gang injunctions should be used on a continuing basis and more resources should be directed into the enforcement and maintenance of gang injunctions, assuming they are effective, but at some point citizens need to get engaged in the process. It starts by teaching children (not just our own, unfortunately) that gangs are a bad thing. We need to change the paradigm, and that requires a relatively long-term commitment. The action against the KPG represents the first time a local government has sought to have alleged members declared a public nuisance since criminal gang behavior was added to the state’s public nuisance law in 2009. This action (at least the use of injunctions in Nashville) has been planned for a few years. That serves as yet another reason that citizens need to get involved in the push-back effort against gangs. Citizen groups, as evidenced by Occupy Nashville, Wall Street, and so many others, don’t have such a long and extended lead time waiting for the legislators, leadership, and courts to synchronize. Other coverage by NPR here.